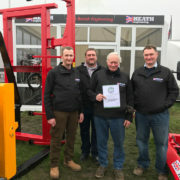 Heath Engineering has scooped a certificate of merit for the Farm Machinery & Equipment Innovation Award at the LAMMA 2017 Innovation Awards. 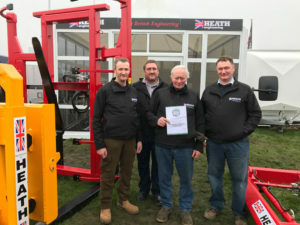 The innovative British manufacturer impressed judges with a range of farm equipment on their stand which received a host of interest over the two days of the show. LAMMA, now in its 35th year, is the UK’s largest farming and agricultural equipment and service show. With almost 800 exhibitors and more than 40,000 attendees, the innovation awards highlight the progressive nature of machinery and equipment of the agricultural supply industry. The aim of the LAMMA Innovation Awards is to draw attention to new ideas, products, techniques, or service excellence.